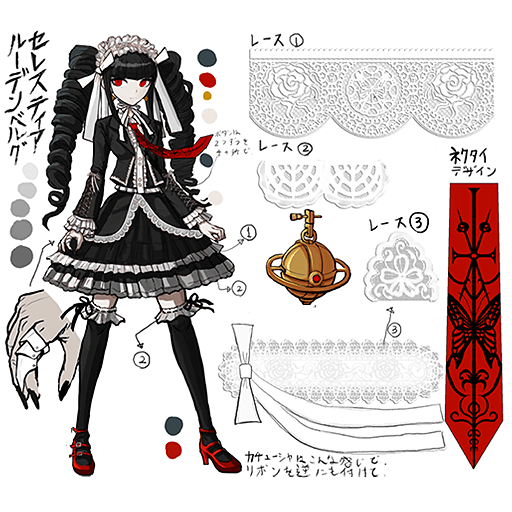 My sister’s third costume is Celestia Ludenberg. 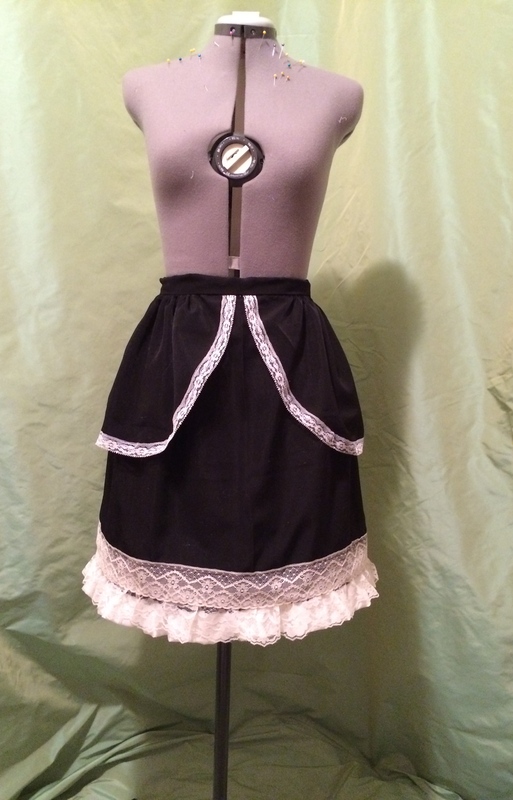 And for as sick and tired as I am right now of sewing, I actually really enjoyed making this one. 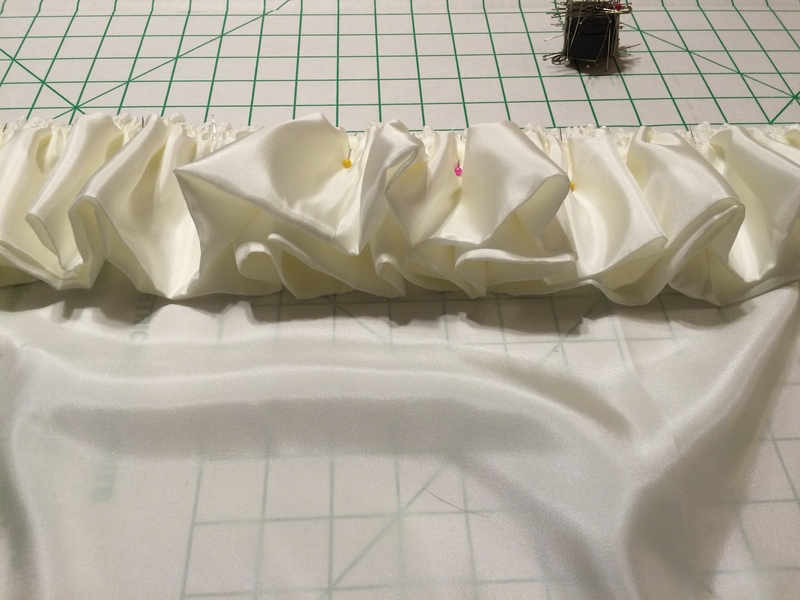 After the Camellia costumes, I thought I would be totally over big floofy skirts for a while – but nope. I loved this one. 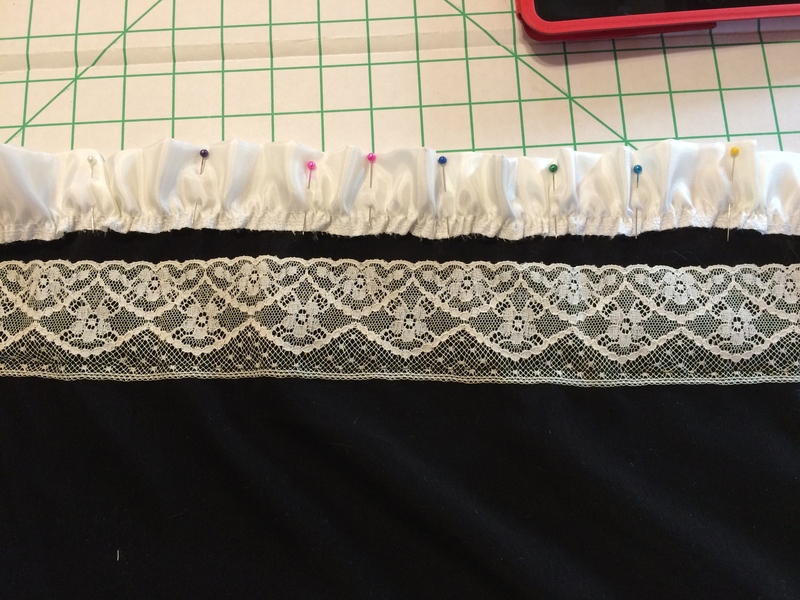 I started yesterday with the petticoat. 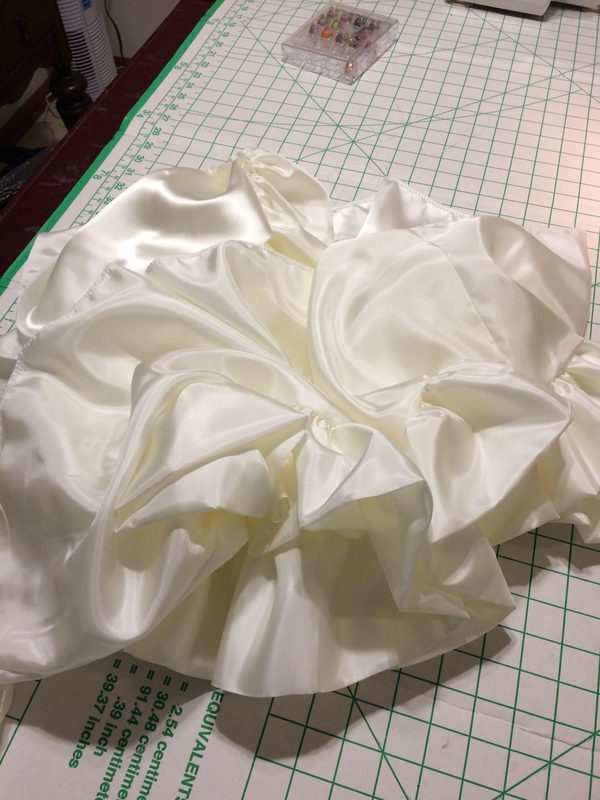 I started with some ivory baroque satin that I picked up at JoAnn’s for a steal off the clearance rack. 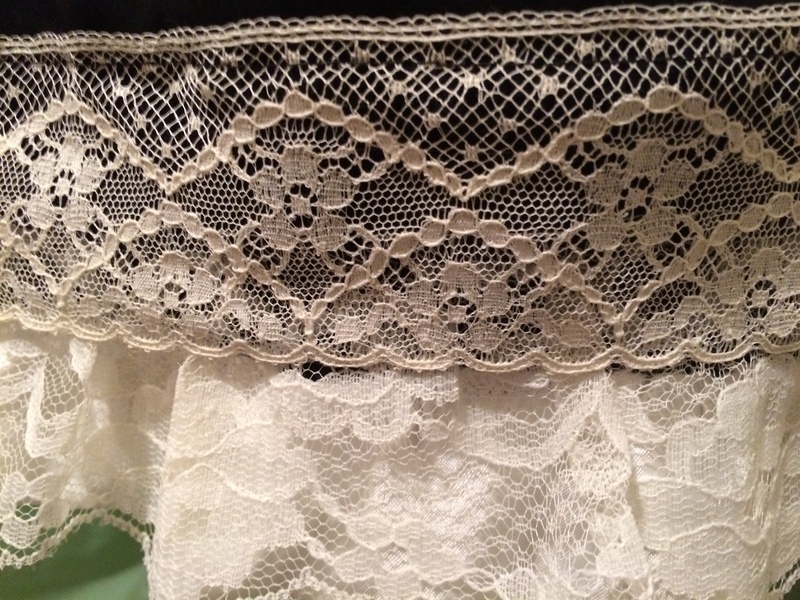 I went with ivory and not white because almost all of the lace in my stash is ivory or off-white, and I knew I was going to be using quite a bit of it, so I wanted everything to match. And I used the reverse side of the fabric, which has a nice sheen to it; the shiny side was too, well, shiny. 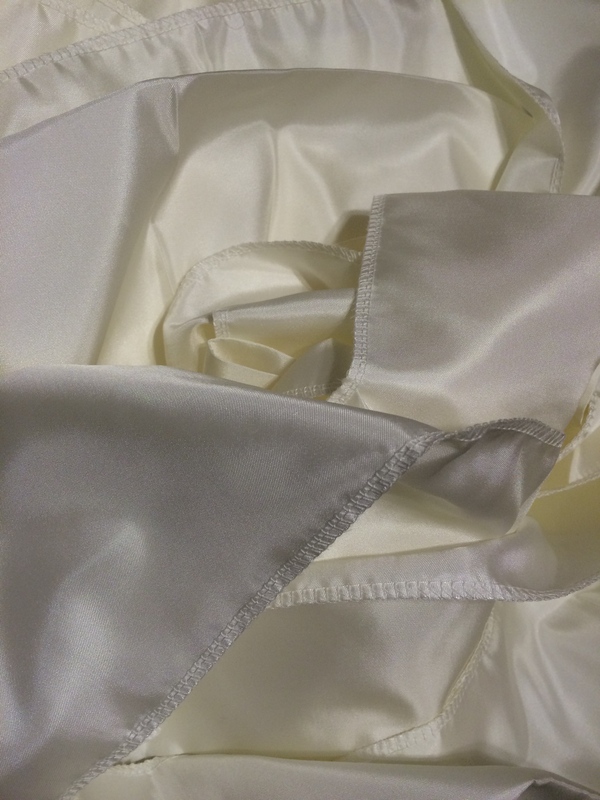 This satin is a fabric I actually rather like; it’s very lightweight and crisp. 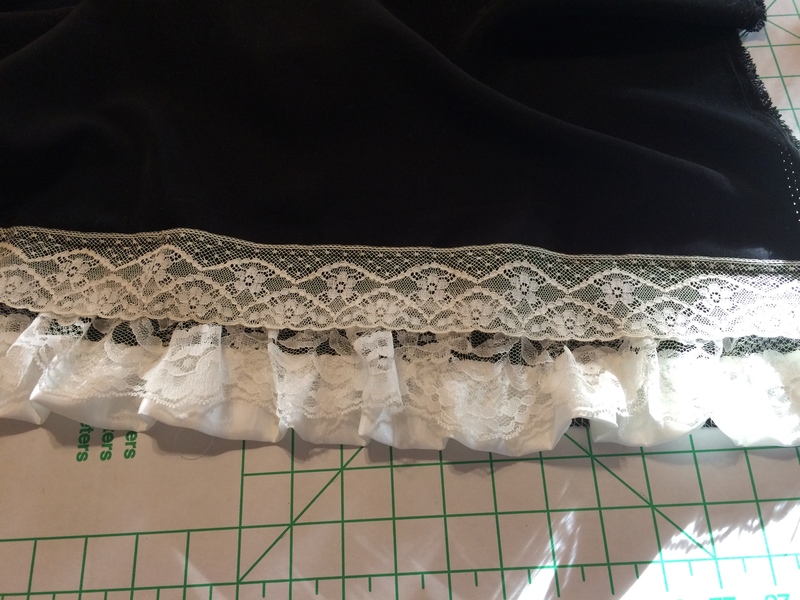 I started cutting strips and made my first big math error – I cut twice as many strips for the bottom tier of the petticoat as I actually needed, because I somehow totally forgot to figure in that my fabric was folded in half. 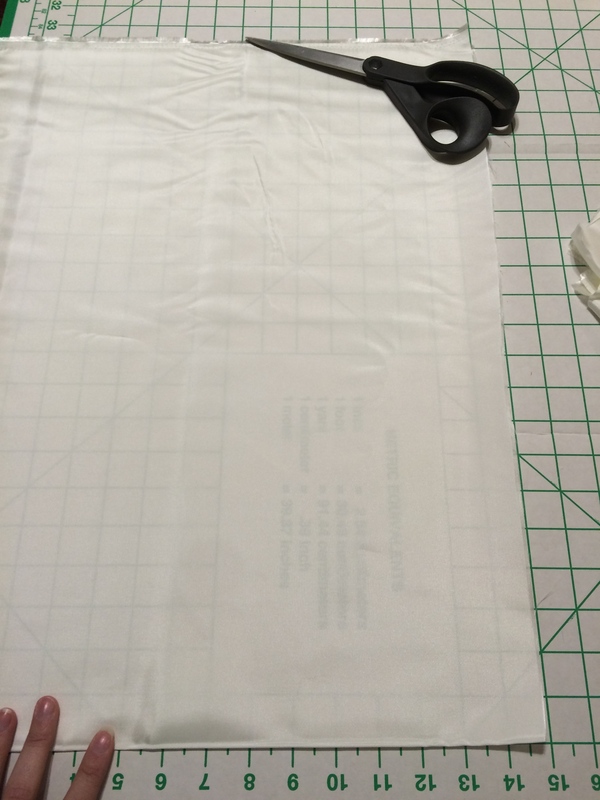 I thought, 22″ x 3 = a 66″ hem, and I want nice tight gathers, so I’ll cut five times the length I want. 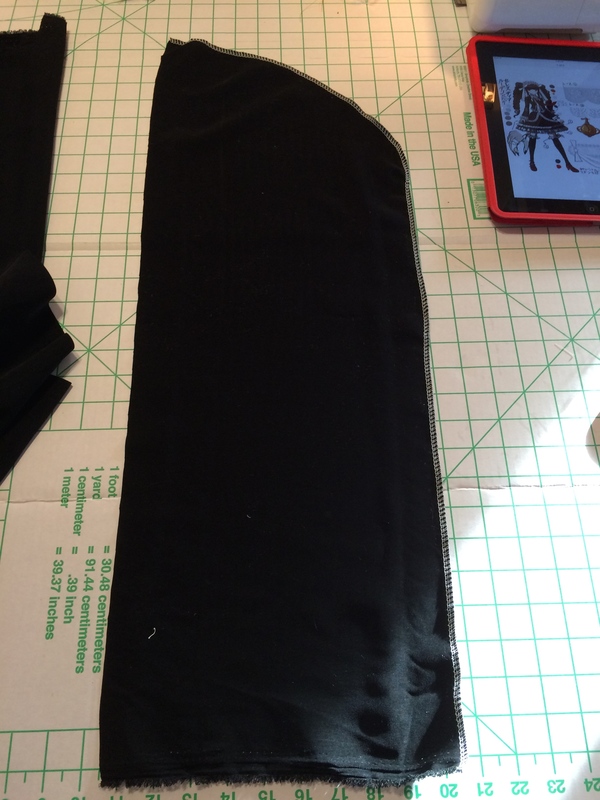 I ended up with fifteen strips to equal a 660″ length – yikes! 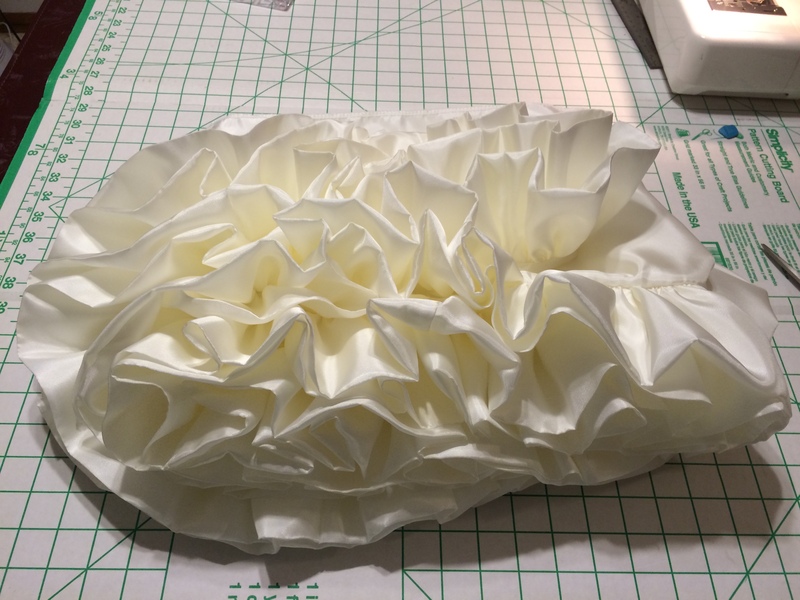 The problem was easily solved; all I did was double up the layer of ruffles on the bottom tier. Which, as it happens, turned out nicely; it’s lovely and puffy! 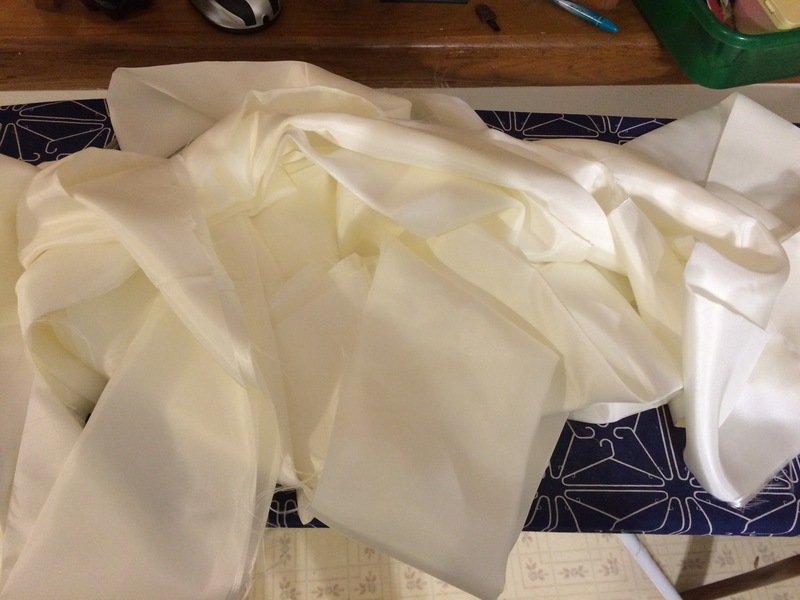 I folded my giant strip of fabric in two – no way in heck was I going to hem 660″ of satin – and serged one edge, and started gathering. 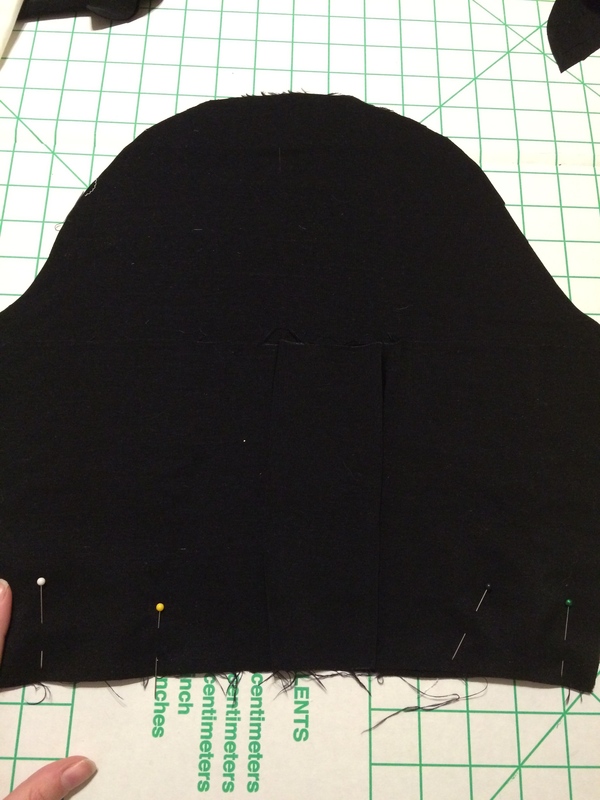 I went around the hem once, gathering approximately 2.5 strips onto each panel of my second tier. When I got back to the beginning, I went around again for a second layer. 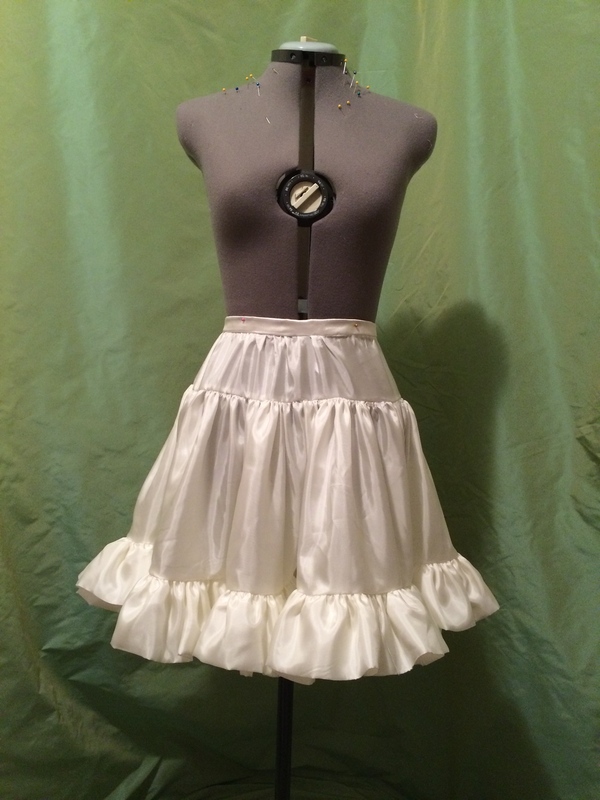 The bottom of the skirt with all the ruffles sewed down – fluffy! 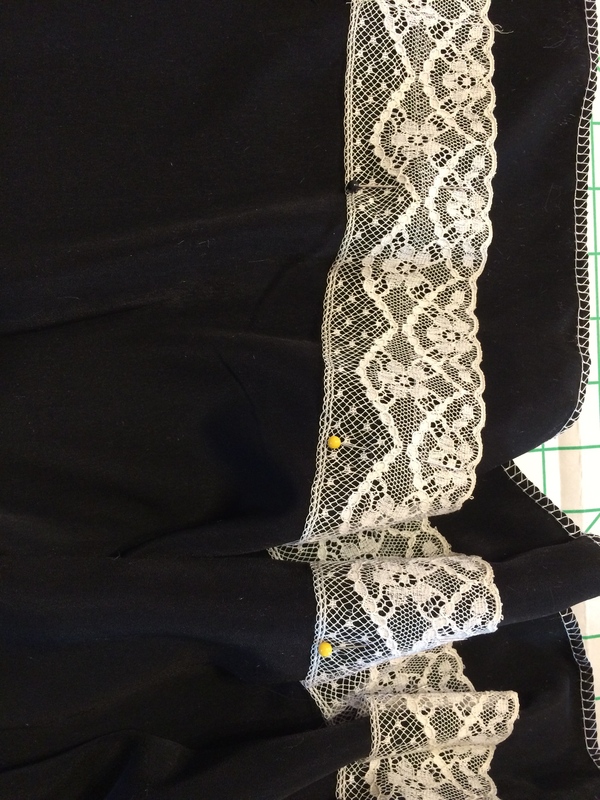 I gathered my second tier to a yoke and then attached a waistband. 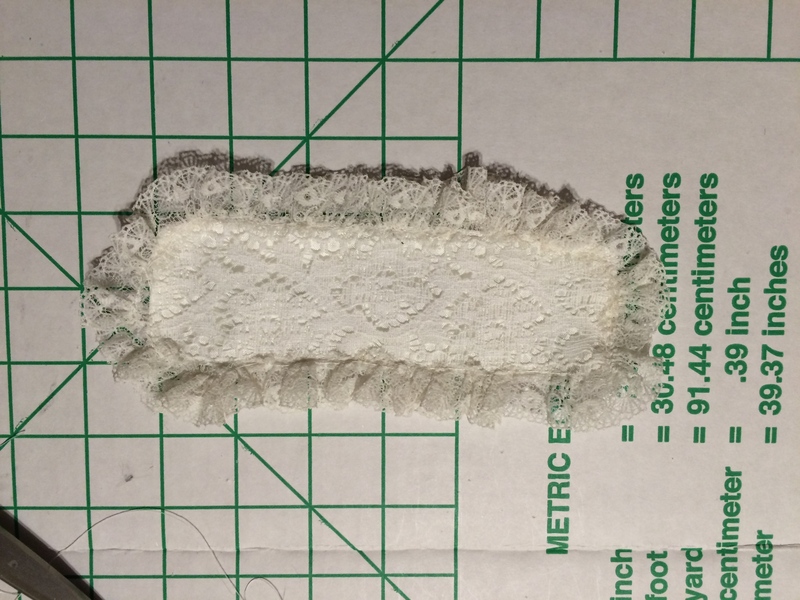 Here’s where I made my second stupid math error – the waistband needed to be 27″; I cut a strip 17″ long doubled, and it wasn’t until I was stitching the waistband down on the inside that it occurred to me that 17 is not half of 27. So I had to remove it, cut it down, and start again. I do these kinds of dumb and totally avoidable things all the time. No wonder I can never finish any projects! Today, I took on the skirt and jacket. 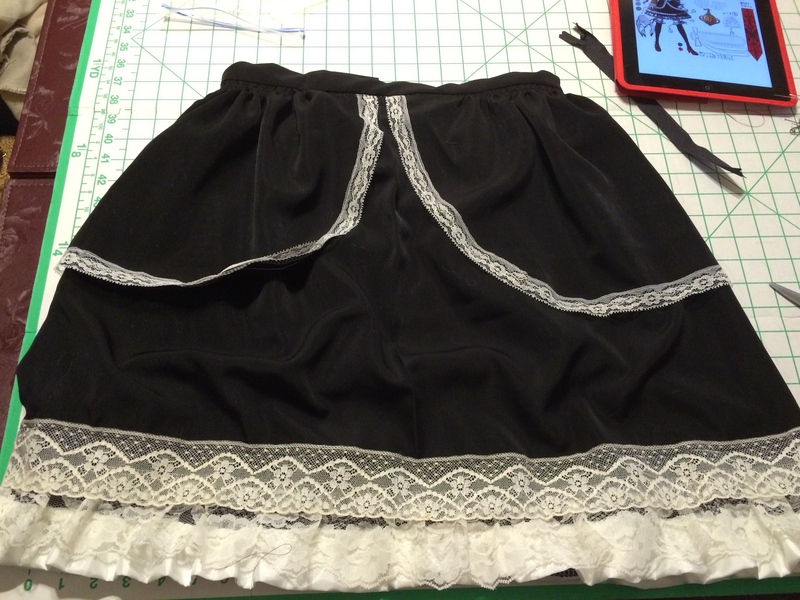 I started with the skirt. I used black peach skin again, because I had quite a lot left over from my Black Lady dress and I really do love the way it looks. 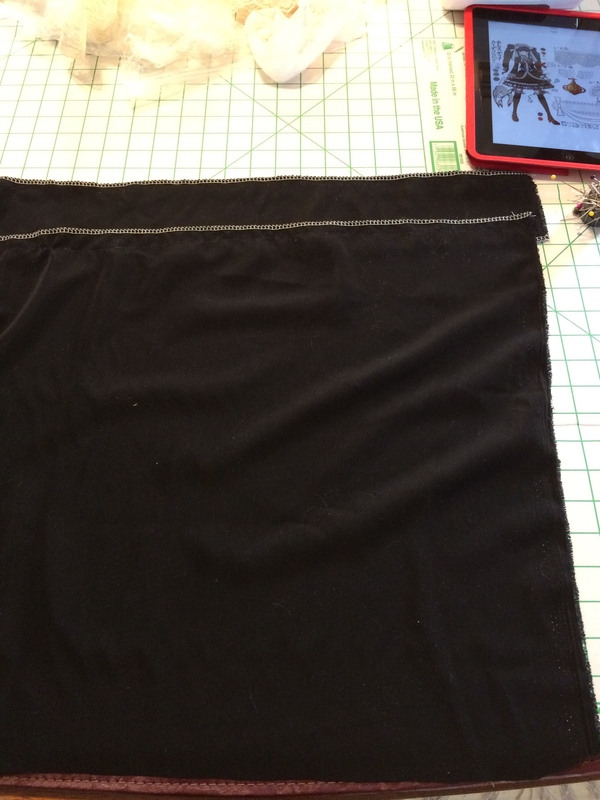 The skirt is one panel long, with an extra strip at the bottom, because I knew I didn’t have enough fabric to actually make the skirt double-layered, the way it looks in the reference image. I went through my lace stash and ended up using quite a bit of it up. 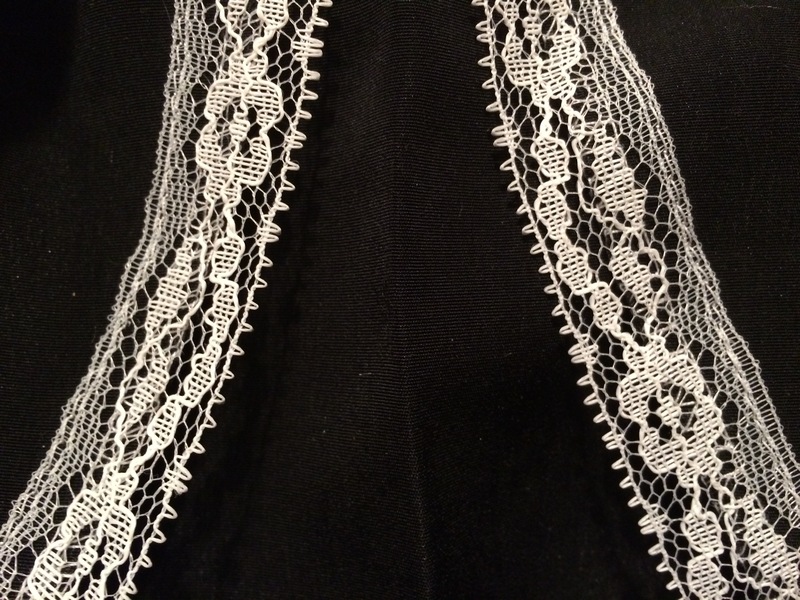 I collect lace like nobody’s business – I buy it at thrift stores, yard sales, estate sales, anywhere I can find it but at the fabric store. 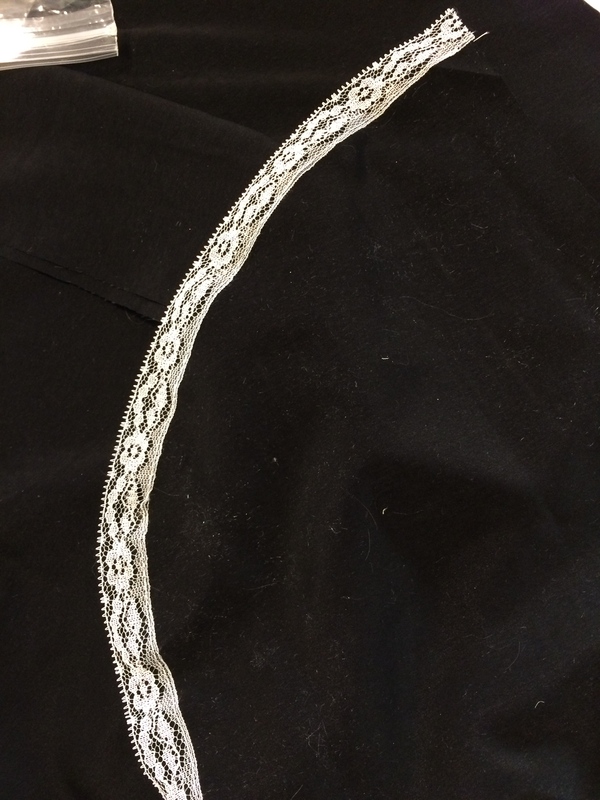 Which is a shame, because they actually did have some lace at JoAnn’s that looked almost identical to the lace in the reference pic – but I sure wasn’t about to spend $6 a yard on it, considering how much I need for this costume. 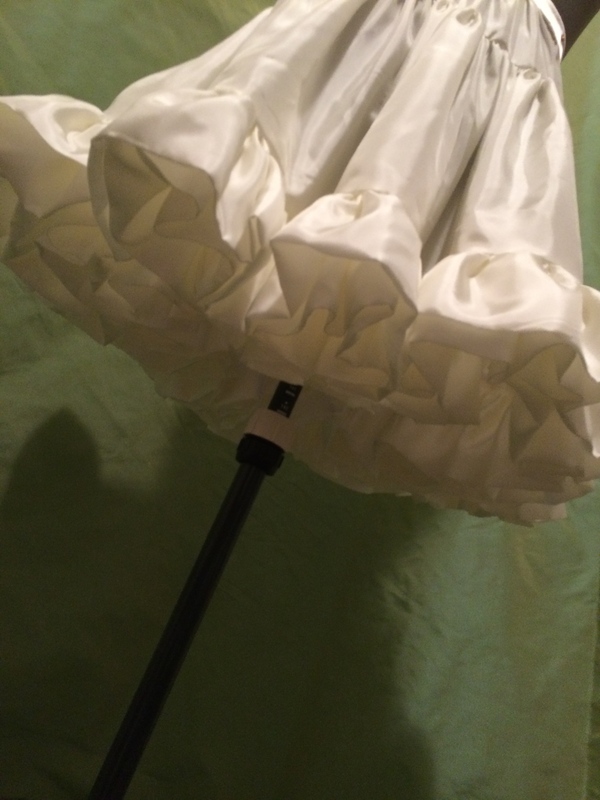 I used a ruffle made with my ivory satin as well as lace on the bottom of the skirt. Hey, the frillier, the better! 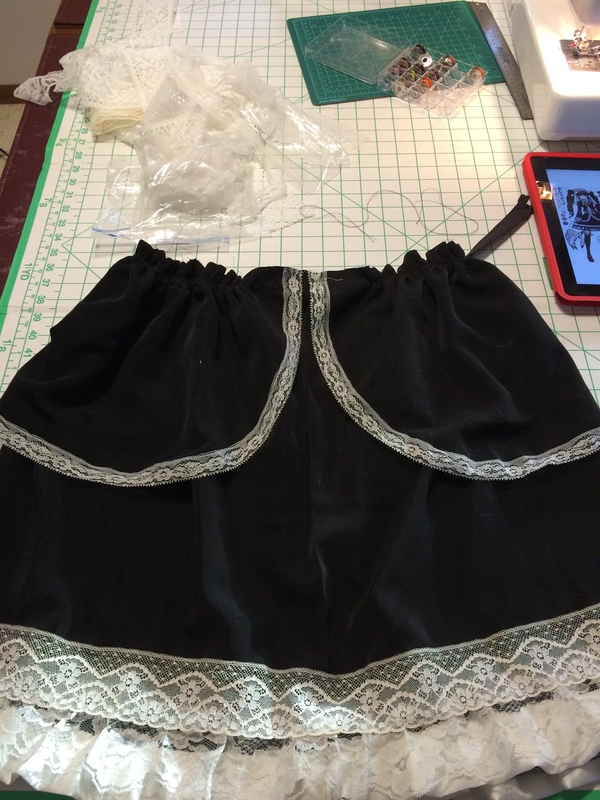 I cut two long pieces with one side rounded for the little peplum/overskirt… whatever. Some more stash lace on that. 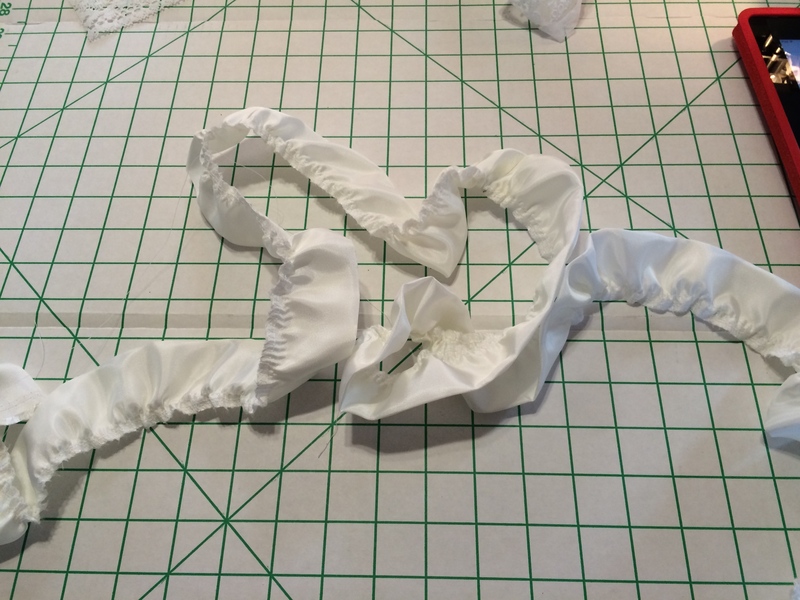 I then gathered the skirt to the right waist length… and as much fun as doing the satin petticoat was, trying to gather two layers of peach skin is very much the opposite. I should have gathered with a cord, but I didn’t have any on hand. Anyway, it got done. 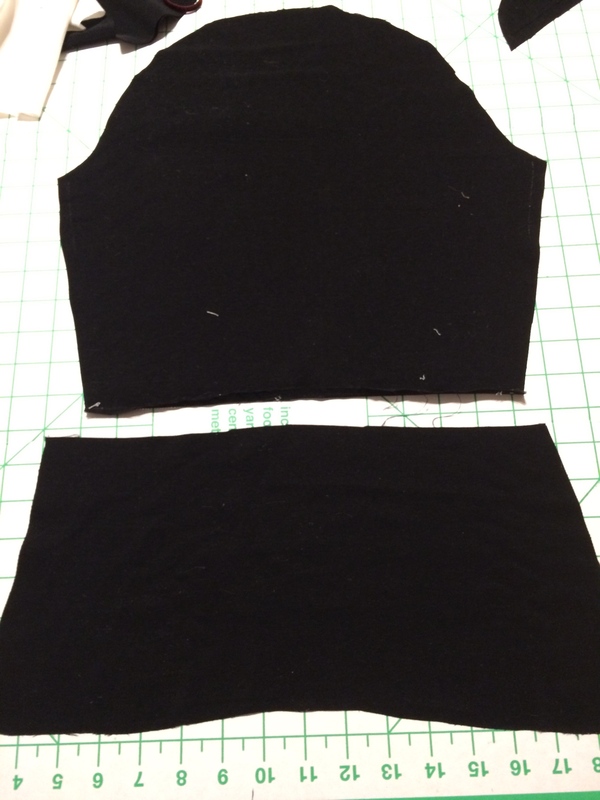 Then I just added a waistband and a zipper and it was done! 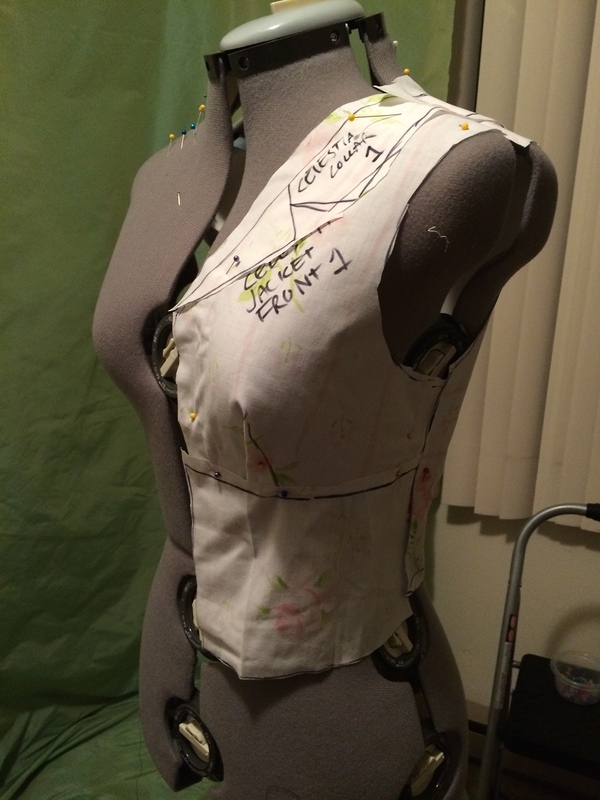 I draped the jacket pattern in three pieces, so that it’s fitted around the bust and has a sort of empire waistline, like in the picture. Yet more stash lace around the edge of the jacket! I’m extremely not happy with the collar. It’s too small and it doesn’t lay right. 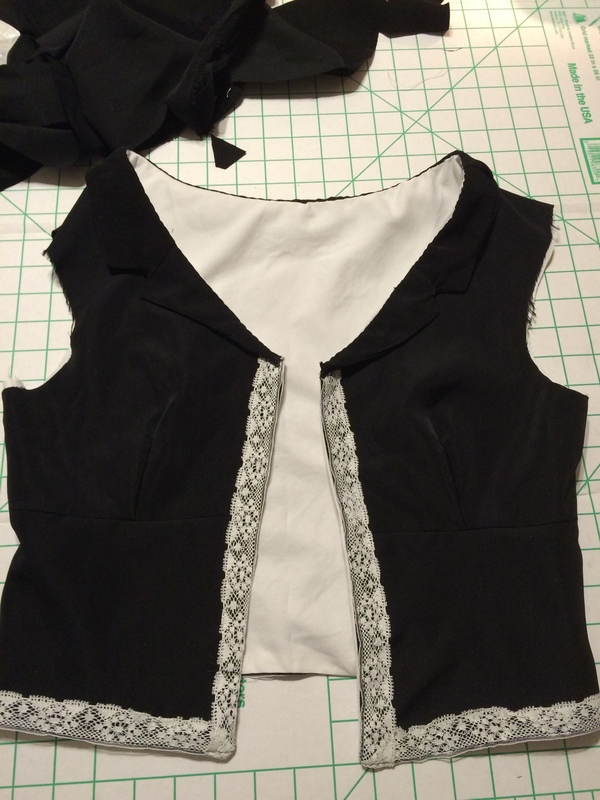 Possibly that’s because I cut the neckline of the jacket too wide, but I want to see if I can fix it if I have time. 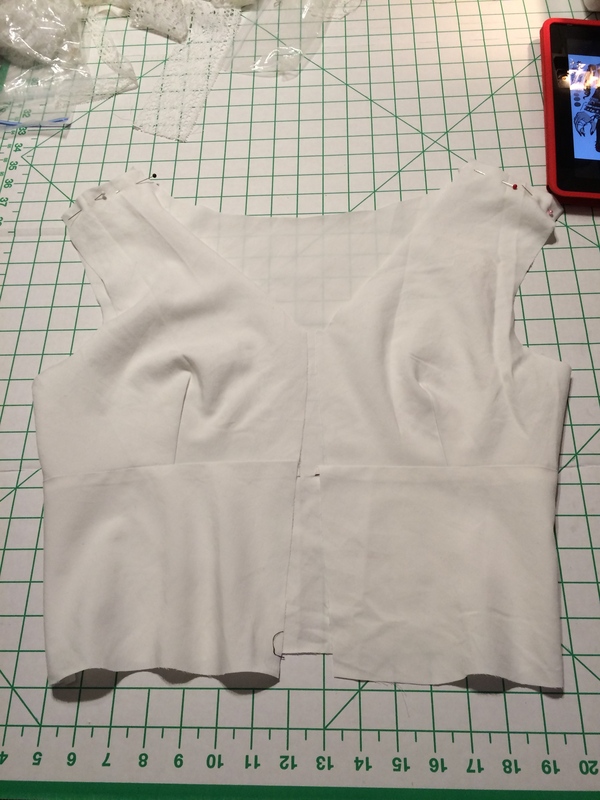 For the sleeves, I drew up a basic sleeve pattern, and then cut it at the elbow line. 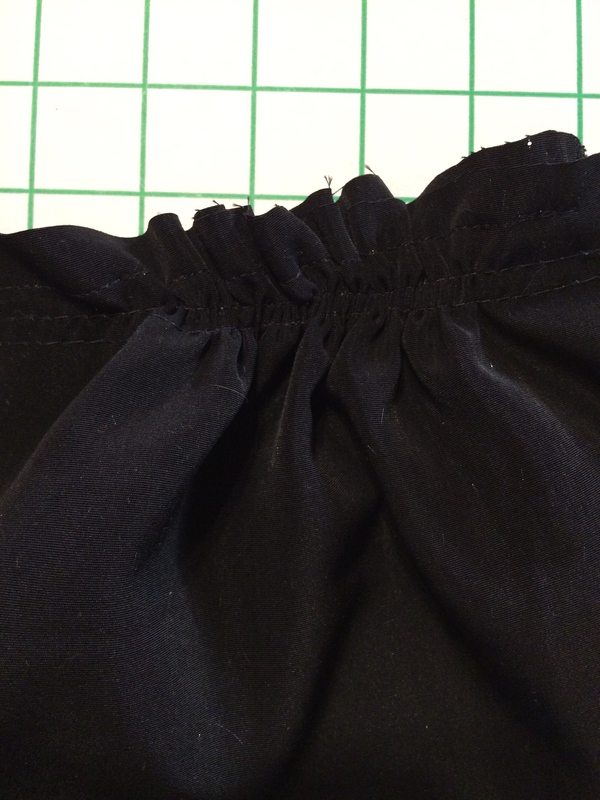 I made the bottom part wider, and pleated it down the middle to fit the upper part before stitching it on. 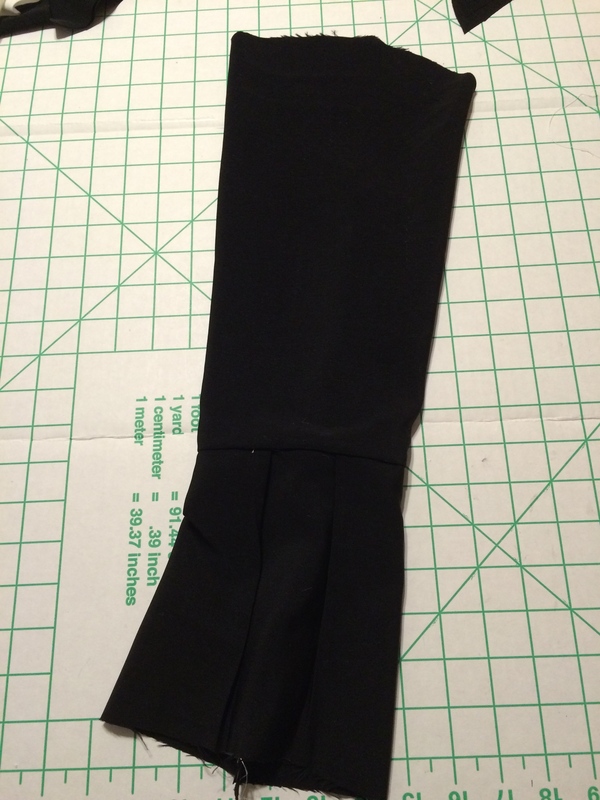 I still have to add the ribbon lacing to that part of the sleeve, but I don’t have any ribbon in my stash that I really like for it at the moment. 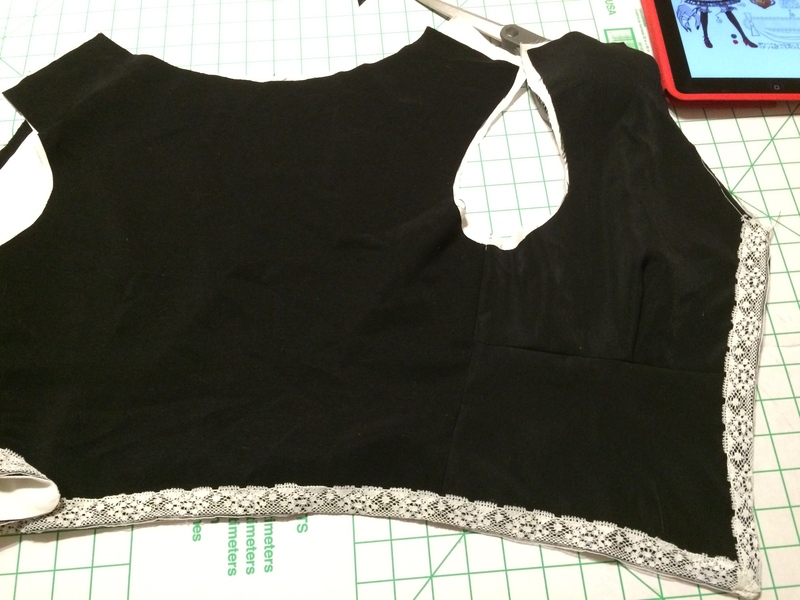 After adding the sleeves, all they needed was hemming and trim and it was done! 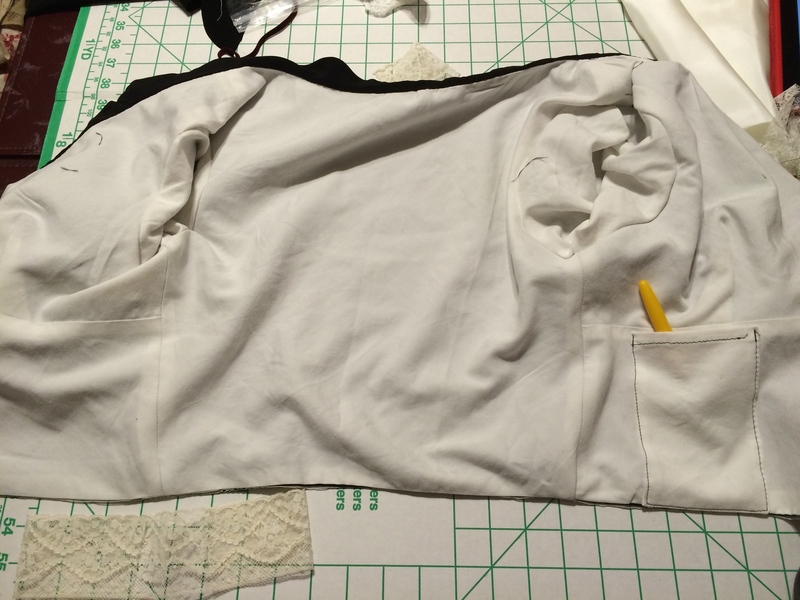 I put a phone-shaped pocket on the inside, too. I love pockets in costumes. I always mean to put them in everything I make, and then by the time I remember it’s too late, but I got one in on this one. 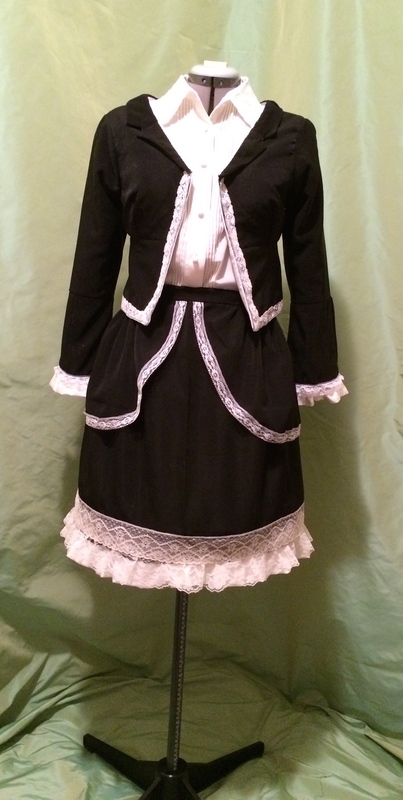 Here’s the finished outfit, with petticoat underneath. 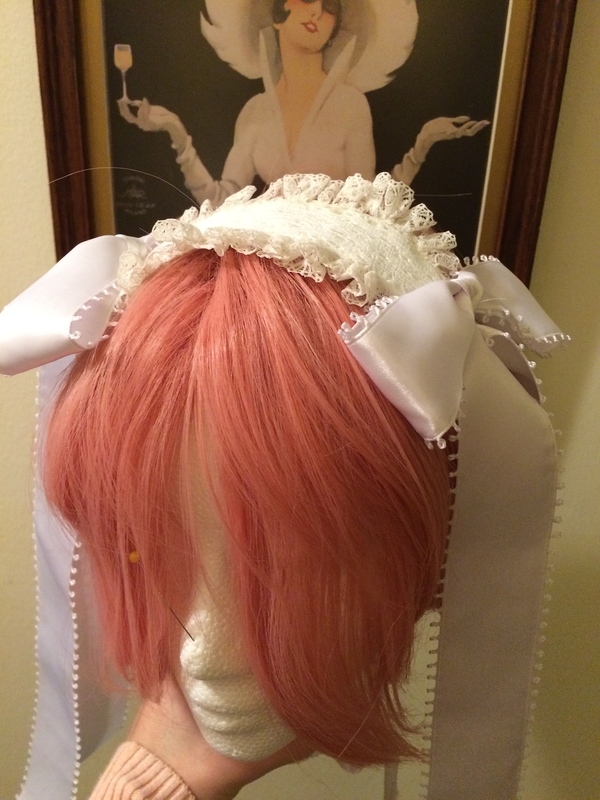 It’s not as big as I would have liked; I think the peach skin skirt is too heavy and the satin petticoat too light. 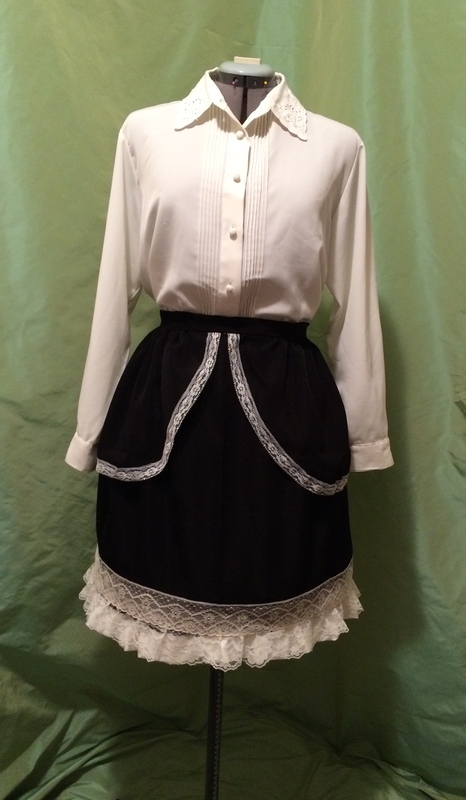 The shirt is just a white button-down that I picked up at the thrift store; it has a nice looking collar. This little lacy white hat… thing. 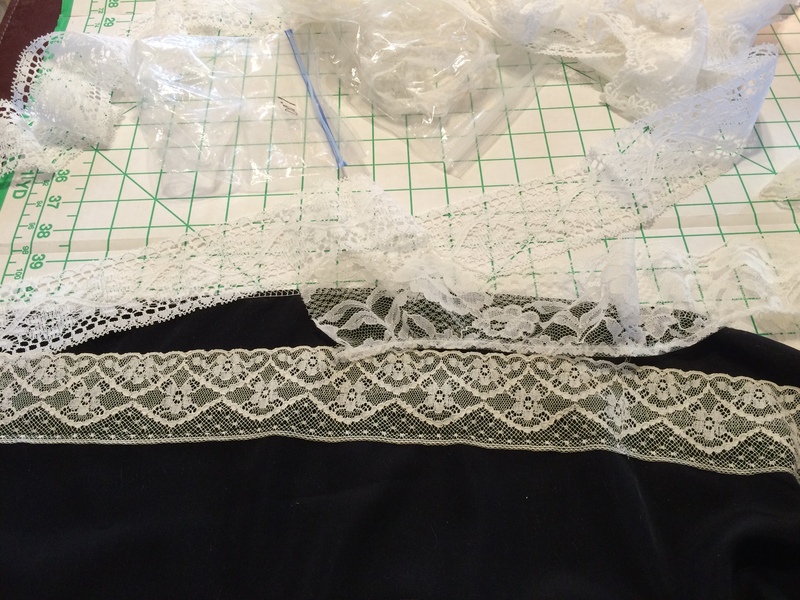 I took some of the ivory satin and laid some lace over it, and then gathered another strip of lace to the edge. At this point, it looked like the world’s most uncomfortable sanitary pad. 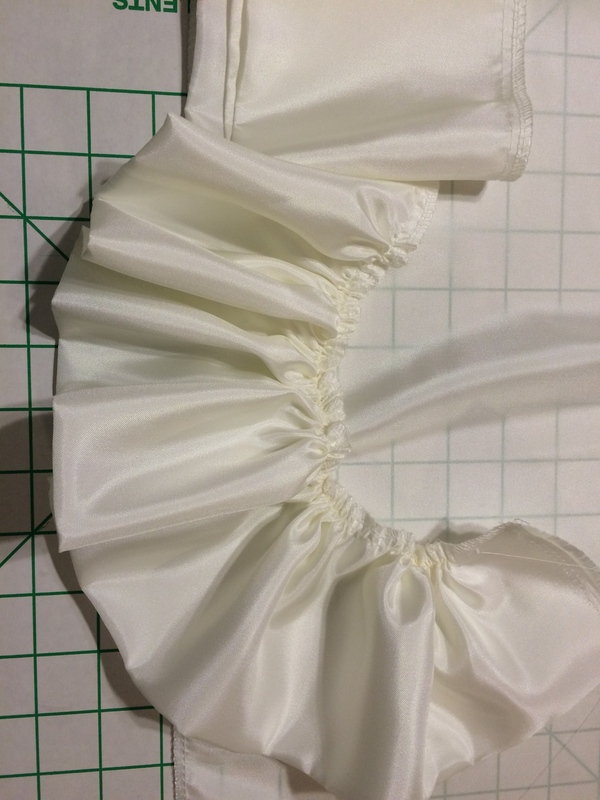 I added giant white satin ribbon bows to the ends and a ribbon to tie it around your neck, and it looks a bit more like a hat. In my head, though, I still am calling it the lacy pad. As you can see, I’m modeling it on my Black Lady wig, which I spent nearly three hours on last night and am not even halfway done styling. UGH – I knew it was going to be a chore, but I really don’t enjoy styling wigs. 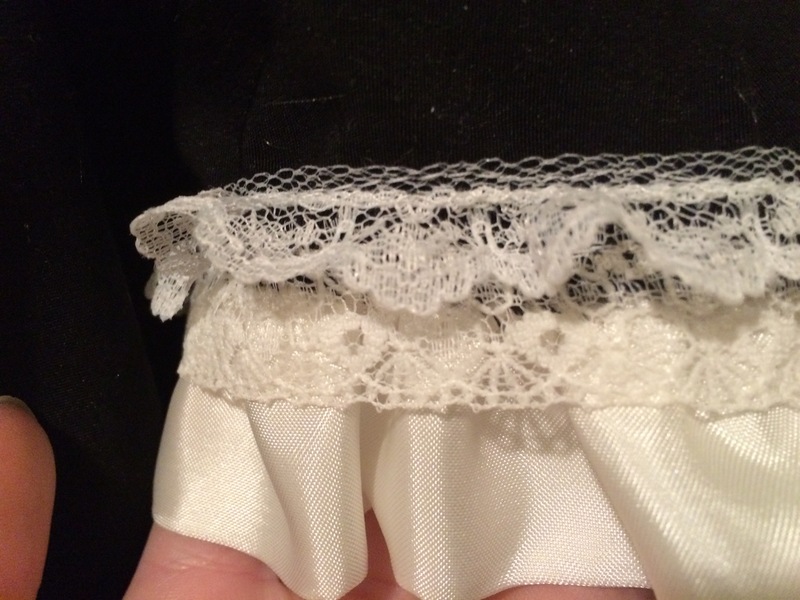 And here are some close-up shots of the various different laces I used. 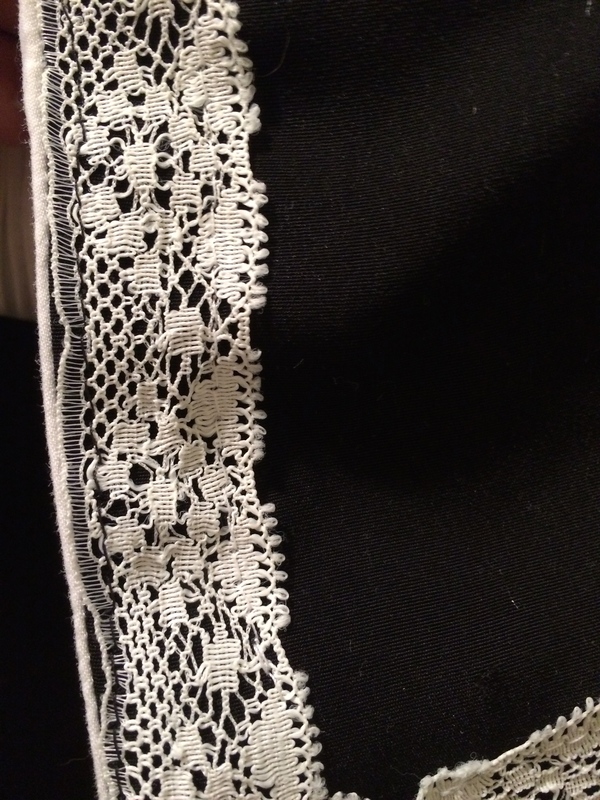 The lower one on the sleeve cuff – last picture – is the same as what’s on the lacy hat. 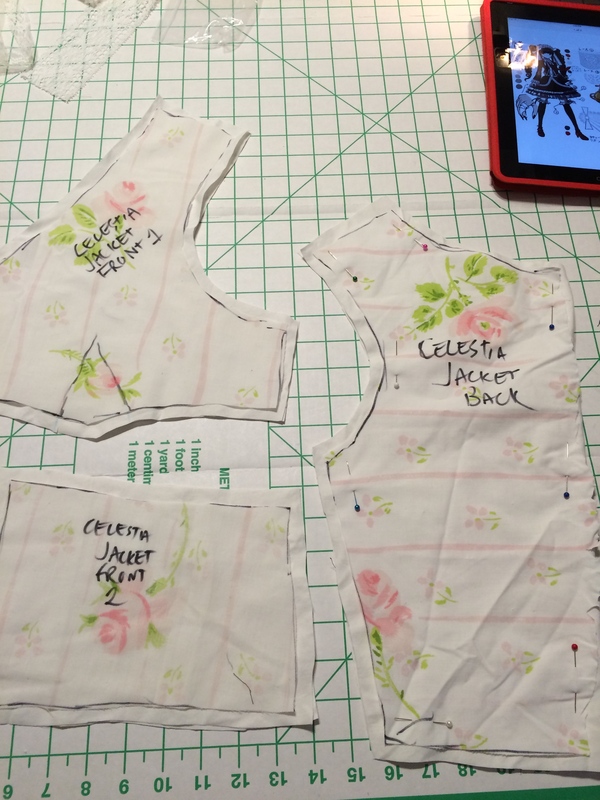 Phew – one more costume out of the way! 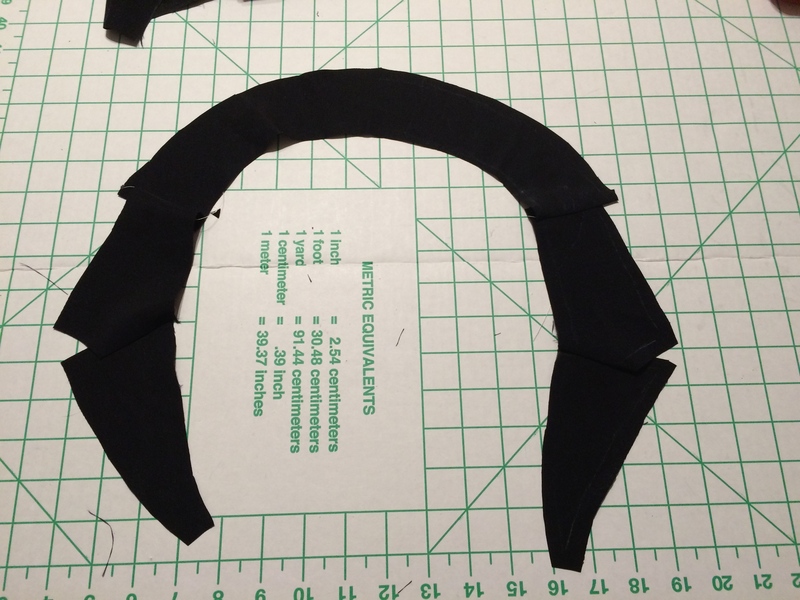 Starting and finishing two entire costumes – minus bits and bobs – in four days might be a record for me. 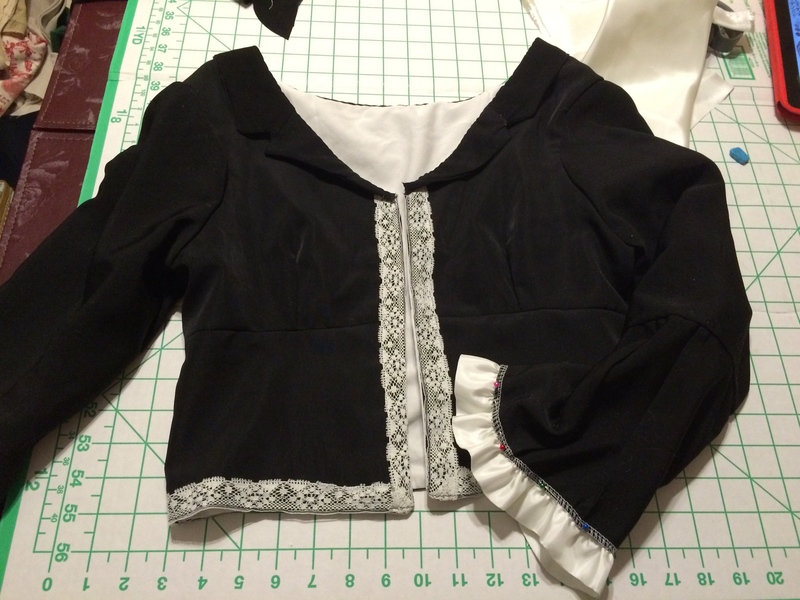 I still have to trim the sleeves, and fashion the frilly garter-type things she’s wearing for this costume. Tomorrow I’m going to try and finish up my Lucia uniform, as well as some other small things that have gone unfinished so far.